Eurolanche Fan Club interviewed one of the top players of the upcoming NHL Draft 2014. There are not many people in the world that could say they sat in the Stanley Cup when they were babies. Brendan Lemieux, a son of a legendary Claude Lemieux, experienced it. 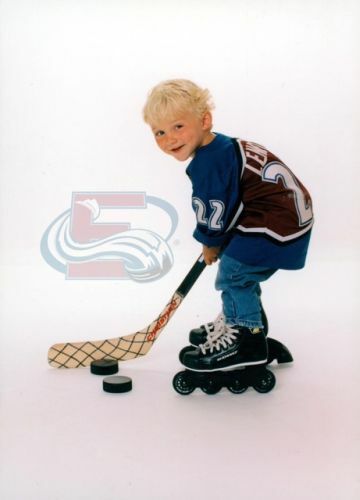 His father won the Stanley Cup in 1996 in the Colorado Avalanche uniform. Brendan was just three months old (he was born in Denver) in that time, when his dad placed him in the most famous sports trophy in the world. 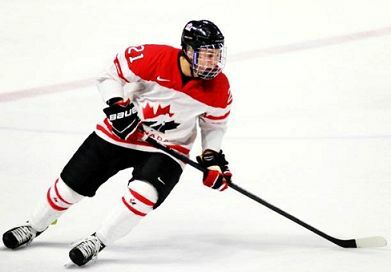 Eighteen years later, Brendan is one of the top candidates for being chosen by the NHL team in the first round of the Draft 2014. Colorado Avalanche is one of the candidates to pick Brendan of their 23rd position. 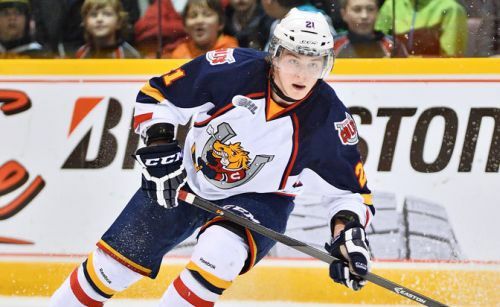 Brendan played past two seasons in the OHL for the Barrie Colts. In his first season, the team managed to the OHL's finals, but was defeat by London Knights in a big drama. Scout reports compare Brendan with his father Claude in their hockey style that is almost the same. "Like his father Claude, Brendan will drive the opposing team crazy as he is the perfect agitator. Lemieux also has the ability to burn you offensively as he is a top 5 scorer on Barrie," informs one of the reports. Brendan would be a great addition to any team with his scoring and physical skills. Some media describes him like somebody between Gabriel Landeskog and Jamie McGinn. The Avs did a formal interview with Brendan at the recent NHL Combine and they are not denying it would be great to pick him at the Draft. It would be just another great story from the Avalanche organization. 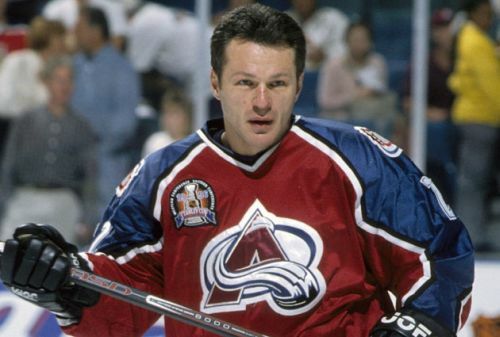 Another Lemieux in Denver after fantastic years spent with Claude. You can follow Brendan on his Twitter account @blemieux22. How do you feel after your season with the Barrie Colts? We had a year that could’ve been a little bit longer, we kinda fell short in the playoffs, but from a personal standpoint I guess we had a better year than my first season here. Moving forward I think I had a decent year and I’m looking forward to the draft now. I want to make it to the NHL as soon as possible. Comparing this season and the previous one, did you believe you could at least reach the same success as last season? Yeah, I definitely had more offensive success in my second season, mostly because I played more minutes this year. When you’re playing more, you’re obviously going to be more successful. I worked all summer on improving my skills and with the coaching and the team we had, I guess it was more successful than last year. What are you doing during these weeks after your season ended? I’m training a lot, both on and off the ice. I train five days a week and then I skate two or three days a week. I’ll train more when camp gets closer. I’m staying in California, so I’m trying to go to the beach as much as I can, just to regenerate and have fun. It’s been a long season of work. I’m going to have some fun now and then get back to work. Aren’t you getting nervous with the draft getting nearer? Yeah, definitely. It’s the one thing I can’t really control. I’m just going to get ready for camp as much as I can and after that there’s not much I can do. I’m definitely nervous. Could you name 5 NHL teams you’d like to be drafted by? Colorado, San Jose, Anaheim, Los Angeles and New Jersey. What’s your plan for the summer after the draft? I’ll try to make a good impact right away. I’ll keep training and then I’ll come back to California to take a couple of days off. Then there’s more training, mini-camp and I’ll do my best to make the team. You were born in Denver. Do you have some memories from your childhood there? I remember watching my dad play. I also remember his time in New Jersey. I think it was 2000 and I was like 4 years old. When your dad won the Stanley Cup in ’96, he placed you on top of the Cup when you were just three months old. What were your thoughts upon seeing this picture for the first time? I thought it was really cool. I want to win the Cup and I want to do this for my kids someday. I’m obviously very lucky to have a dad that played the game and I got to do this kind of stuff at such a young age. With that being said, I want to win my own Cup. How old were you when you watched the ’96 Finals for the first time? I was probably 10 or 11 years old. At which age did you start to play hockey? Oh gosh, I started to play when I was very young. I probably started my career playing Triple A Hockey when I was 8 or 10 in Arizona for the Junior Coyotes. I also played in Dallas, I played Toronto in the GTMMHL, and I played in L.A.... I played all over. Two years ago, why did you decide to leave the Green Bay Gamblers after 11 games for the OHL? For me it was pretty easy. I just wanted to be the best NHL-ready player I could be and I felt like I might not develop as quickly in Green Bay as I could in Barrie with Dale Hawerchuk. A year ago, you suffered a final-game loss to the London Knights. Was it hard? It was very hard. We still pissed off about it even though it was a year ago. We didn’t get our revenge this year and we might come back for it next year. Which junior game remains unforgettable for you? Probably that game. There were also some memorable games against North Bay in this year’s playoffs, probably my first playoff hat-trick, which was also a big win for the team as we had to come back from behind. Did you play at this season’s Ivan Hlinka Memorial tournament? Yeah, half of the tournament was in Slovakia, the other half in Czech Republic. We walked around in downtown Bratislava and really got to see the beautiful city. It’s really nice there. Have you ever been to the Pepsi Center? I think three years ago maybe. So you regularly come back to Denver? Yes, somewhat regularly. Whenever I’m in the area I go to see a game for sure. Would it mean a lot to you if the Avalanche would draft you? It’d be a big honor if they drafted me. 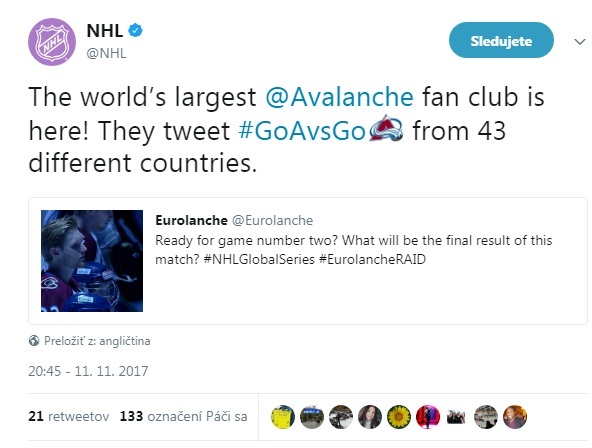 Have you followed the Avs for the past seasons? Have you watched some games? Absolutely, I love watching the Avalanche play. I love watching MacKinnon play, he’s a truly exceptional player. What do you think about the new management and the new coach? I think Patrick’s going to be a great coach. I lot of those guys are great players, a lot of those guys are hard workers both on and off the ice and all they want to do is win. I think they have a great management. Do you know in person any current Avs players? I know Jamie McGinn a little bit, my dad used to play with him and San Jose. We used to hang out when I was younger. Not too many current players, though. Imagine you would join the Avalanche. Which players would you like to have as your linemates? There’re a lot of great players, but if I could pick I’d want to play with MacKinnon in the middle or even on the wing for sure. Maybe Duchene. I’d like to imagine playing as a power-forward with those guys, something like O’Reilly sometimes does. There are some reports saying that the Avalanche did a formal interview with you during the NHL Combine. Could you share some details? Yeah, they did an interview with me. I had about 28 interviews in total. I can’t really say too much about it, but I can say that we had a great interview and from what I can tell they were interested in picking me, but with that being said you never know. They wanted to get to know me as a person, as a player, where I thought my game will be at the next level. It was very serious. It’s a big deal for them and obviously it’s a big deal for me, too. There’s lots of time and money involved. The best way of describing the interview would be professional. What else did you experience at the Combine? It was a great experience. It gave you an idea of what teams like you and what teams don’t like you at all and where you’re going to be in the future. We as the players really got to know ourselves better. There were 28 people asking about you, 28 different interviews about yourself. It was a good time. The Combine was very challenging and really hard, but it was fun. Which of your hockey skills do you consider your strengths and which do you think should you work on improving? I think I’m a good straight line skates, I’m a powerful skater. I definitely could improve my lateral quickness. I’d really like to improve all aspects of my game, because everything’s quicker in the NHL, the passing, the shooting. I’m very good at tipping pucks and I’m really good in front of the net. I also think I’m a good shooter. What’s your relationship between you and your father? My dad and I are best friends. We have a great relationship. My dad’s my mentor. Have you ever talked about the famous Avalanche – Red Wings rivalry? We’ve talked about it. What most people don’t understand is you didn’t want to hurt someone individually in those days. Kris Draper was just unfortunate and I know that my dad didn’t want to hurt him. They really made a bigger deal out of it than it really was. It’s all kind of blown over by now. In his book, Adrian Dater mentioned an incident, where your father was leaving the Pepsi Center with you as a baby when a bus with the Red Wings players suddenly pulled over and there was some smack talk. My dad was absolutely pissed off, put me down and went into the Red Wings bus. He told them that if they would ever do that again he’d kill them or something like that. As I said, it’s all blown over by now, but it was just like hockey should be. I think it should be passionate and emotional like that. I think the game is missing that nowadays. What would happen if the Red Wings drafted you? (Laughs) I think it would be the same as anywhere else for me. I’d just try to make the team. Maybe it would be a little bit different with the fans, but hopefully they’d like my style of play. 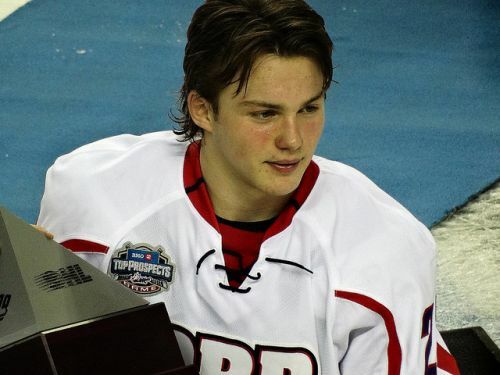 Have you and your father talked about the possibility of the Avalanche drafting you? Absolutely. It would be a dream for me to play for the Avalanche, I’d love to play for them. Your father played a couple of games in China. Did you travel with him? No, I didn’t go to China with him, but I was sometimes travelling with him while he was still playing in the NHL. What’s your father doing these days? He’s running a hockey agency representing players. Do you think you’ll make it to the NHL next season? I think it all depends on the team that drafts me. I think I can be effective playing limited minutes and I can be effective playing a role. I’ll try to make the NHL out of camp, because I think I could be effective, but I could also use another year in the juniors. Michal Hezely did a transcript of this interview and translated it to European languages.